2) Network and Sharing Center window will appear, after that click Manage network connections. 3) Network Connections window will appears. 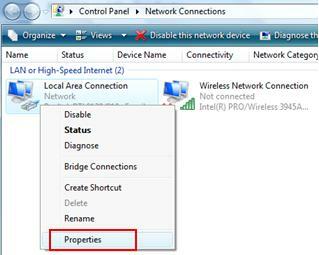 Here you can right click on the network card that you wish to disable IPv6 and click Properties. 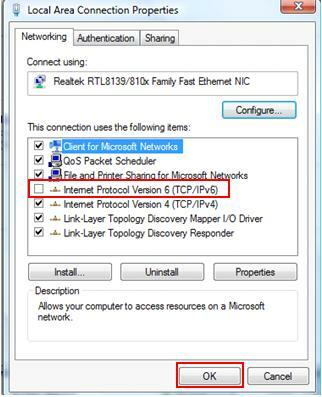 4) In the Local Area Connection Properties window, untick Internet Protocol Version 6 (TCP/IPv6) and click OK. Note: This method disables IPv6 on your LAN interfaces and connections, but does not disable IPv6 on tunnel interfaces or the IPv6 loopback interface. You need to make change in Windows registry in order to disable the IPv6 on tunnel interface. You can stop here if don’t feel like working with Windows registry. If not, proceed with Step 5. 5) Type regedit in command prompt in order to launch registry editor. 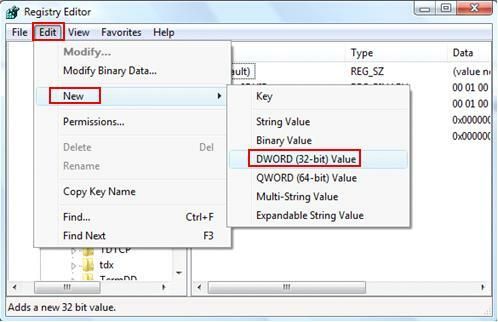 a) In the Edit menu, go to New, and then click DWORD (32-bit) Value. 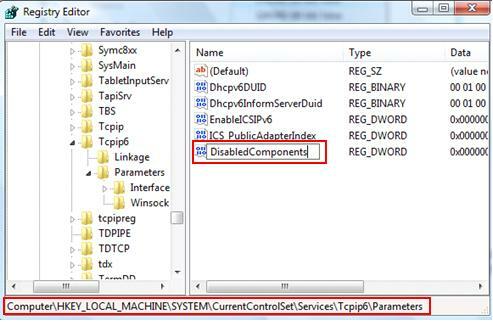 b) Type DisabledComponents, and then press ENTER. 7) Double-click DisabledComponents, set the value as 0xffffffff (hexadecimal value) (just type ffffffff) to disable IPv6 on LAN interfaces, connections, and tunnel interfaces except the IPv6 loopback interface, finally click OK.
8) You must restart the computer for this registry value to take effect. 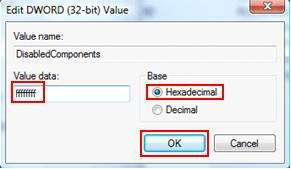 Return to top of "Simple Way to Disable IPv6 in Windows Vista"! !